Matthew Webb was born in 1848. At the age of 12, he joined a Merchant Navy training ship in Liverpool. 24 August 1872: J.B. Johnson abandoned his attempt to swim the Channel. Webb decided to begin training. 12 August 1875: Several hours into his first attempt, a violent storm blew up and Webb was forced to give up. 24 August, at 12.56 pm: Naked and smeared with porpoise oil, Webb headed out from Dover for a second attempt. Accompanied on his swim by 3 escorts, he reached Calais at 10.41 am on 25 August. Due to unfavourable currents, he swam a total distance of 64 km in 21 hours 45 minutes. Buoyed by his success, he devoted his life to his nautical feats (for example, his 74-hour non-stop swim at Scarborough). 24 July 1883: Webb (aged 35) died in his attempt to cross the Whirlpool Rapids below Niagara Falls. His body was found 4 days later. He stood to pick up $10,000 from an American company if he achieved the feat. An estimated 100,000 people lined the riverbanks. It was another 36 years (September 1911) before anyone swam the Channel again, TW Burgess (on his 16th attempt) beating Webb’s time by 10 minutes. 1926: The first Frenchman (George Michel) swam the Channel. In the same year, Gertrude Ederle set out from Cap Gris Nez and became the first woman to achieve the feat. The American, who had also won a gold and 2 bronze medals at the 1924 Olympics, died in 2003 at the age of 97. Up to the end of 2011, 1,150 people are thought to have swum the Channel. 1910: A bust of Webb, by the sculptor Dayle-Jones, was erected in Dover. 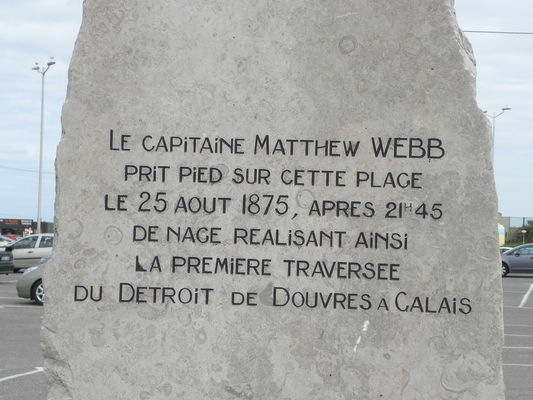 30 June 1979: A commemorative stone is unveiled, a joint venture between Les Amis du Vieux Calais (The Friends of Old Calais), Calais Tourist Office and the France-Great Britain Association. There is no review about La Stèle Du Capitaine Webb, be the first to leave one !